Hello my lovelies, I have the very great pleasure to be todays stop on the In The Shadow Of War; Spies, Love & The Lusitania by Colleen Adair Fliedner blog tour. So grab yourself a cuppa and maybe a biscuit and let me tell you a bit about this book. Josette Rogers is the daughter of a rich businessman who must move his family to London when he inherits his uncle’s import/export business. Curtis Carlson is a rising star at the House of Morgan on Wal Street. They each have very different opinions about whether or not America should enter the war. This is the first I have read by Ms Fliedner, but I was so fascinated by the look and sound of this book, those who know me and who read my reviews will know I have a real passion for this era, and I knew that I just had to read it and I am so pleased that I did because In The Shadow Of War is a wonderfully powerful book that really sends tingles down the readers back. We all know the history of the Lusitania and yet there appears to be so few books out there that feature it’s tragic history, which is definitely one of the reasons why I wanted to read this book. This really is an edge of your seat thriller with the hint of romance, there is danger at every turn, spies, and a world that is facing the most brutal and bloodiest of wars where families on all continents are being effected and that human aspect really came across in this. The author does a splendid job at bringing to attention the none battle field struggles and perils that the everyday people from all over the world, from every walk of life had to face day in day out. Not only seeing their husbands, brother’s and son go off to war and worrying whether they will ever be seen again, but there is also the fact that people were starving and desperate. The main plot is brilliant, but is this side story that really captured my attention and I applaud Ms Fliedner for such immersive and powerful writing. A definite must read for those like myself who love reading about this era, it is an atmospheric, powerful and poignant book that really shouldn’t be missed. This was a complimentary copy from the author via Historical Fiction Virtual Book Tours in exchange for an honest review as apart of this blog tour; Thank you Colleen and Amy. In The Shadow Of War can be purchased at Amazon. This entry was posted in Blog Tour, Complimentary copy, Historical Fiction, Reviews, WW1 and tagged Colleen Adair Fliedner, HFVBT Blog Tours, Historical Fiction, In The Shadow Of War, Review, WW1 Fiction. As a teenager in Chicago, May always dreamed of travelling the world. So when she meets handsome George Turner, she jumps at the chance to return to London as his wife. Ten years later, May is wondering if she’s made a terrible mistake. It’s 1914 and war has been declared in Europe. All around, brave young men are being called up to serve. George, banned from conscription himself, has taken to the bottle, and May suspects he’s seeing other women too. She longs for a way to escape. The chance comes when May meets veteran nurse Elsie, who persuades May to join the war effort. May knows nothing of nursing – it will be difficult, dangerous work, but her heart is telling her it’s the right thing to do. But then George does the unthinkable and May’s future is put at risk. Will she have to make the impossible choice between duty to her family and her promise to the soldiers on the front line? And can she live with the consequences if her husband goes through with what he’s threatening to do? This is the second book in the planned trilogy which focus’s on the unbelievably courageous women of the Great War, and I have to say that this is a very worthy follow up to the hugely emotional and incredible The War Nurses and I really cannot wait for the third and final book, which I know will be another emotional ride just as this and the previous book have been. This is an inspiring, emotional, heartbreaking, mesmerising, charming, haunting book that is inspired by the remarkable life of May Borden who was a nurse, novelist and poet during the Great War. The story opens with May in a bit of a depression, the man she thought she was to lead a whole new life with has is now a drunk and worse than that she knows that her husband is cheating on her. She is tired of her life surrounded by a man who doesn’t love or respect her, she wants to escape. Which is when she meets vivacious Elsie, who talks May into joining the nursing core. May knows nothing about nursing, but she feels that this is the very thing that could turn around her life. Even though May is a hugely inspiring woman and what she did was amazing, while reading this I was at times in two frames of mind about May. There is no denying what she did was incredible and I am in awe and applaud everyone of those brave women who went to the front, but at times I felt at times she did act like a child herself, she needed stand up for herself more than she did. I felt she was as conflicted as the very war she was working in, I don’t think she was a strong women but she was a real one, she was plunged into a horrific war while her children were still at home. But what really made me soften towards May was her unrelenting compassion, loyalty and her unrelenting need to help those men who were experiencing the very worst that humans can do to on e and other. I have to say that Lizzie Page is an unbelievably gifted writer, her absolute passion for these incredible women, the history and her thirst to share these wonderful stories with the world is evident in each page she has lovingly written, her love and passion comes through the story. This is another powerful story that makes you stop and really take in what these women sacrificed for us, as with the war Nurses this isn’t just about bombarding the reading with sights and sounds from the front, this is about women coming together forming unbreakable friendships and doing their best to help. It’s a beautiful book and one that really needs to be read, no matter your views on the war we all need to hear these stories. This was an Arc copy from Netgalley in exchange for an honest review. Daughter of War can be purchased from Amazon. This entry was posted in ARC, Netgalley, Reviews, WW1 and tagged Book Outre, Daughters Of war, Lizzie Page, Netgalley, Review, WW1, WW1 Fiction, WW1 Romance. This is a beautiful book that captures a moment in history, that really emphasises the emotional suffering that gripped the country. Set after the great war , The Daughters Christmas Wish focusses on the aftermath of that horrendous war. The main character’s Rose and Nicholas have both lost and now trying to move on with their lives, which I think Ms Cornwall has portrayed beautifully, not that I’m surprised as she is a wonderfully skilful writer who can enchant and engage the reader from the very first page. It’s 1919, the great war is finally over and people are attempting to move on and rebuild their lives after years of heartache and suffering. Nicholas is back home, after the war he couldn’t face returning home without his best friend so he re-enlisted for another year but now he is back to fulfil a promise he made to fellow soldier and fallen friend; Sam. That was to go back to home to Cornwall and give Sam’s fiancée; Rose the best Christmas she could ever wish for. I love the way he comes to make her Christmas special and how she wanted it, he took a poem that she wrote to Sam about Christmas and made every line of that poem reality for her. Which really is the most romantic thing that you have ever read and really shows just what an incredibly kind and honourable and gentle man Nicholas is. He too has been affected by his experiences from the war, those experiences have imprinted on him a sense of needing to over come loss. Rose doesn’t really feel like celebrating Christmas, she is deeply unhappy, her whole life has completely changed, but not for the good. Rose and her family have all been scarred by the war, her brother Arthur and her fiancée Sam have both been killed on the front which has left her in a deeply unhappy state and that of her parent’s too, who have become grief stricken to the point that they are stuck in the darkness and forget about their daughter. My heart broke for Rose, she is clearly in pain, she is struggling and a bit lost, but she has an inner strength that makes her get up and put one foot in front of the other. I loved this book, it’s a beautiful and poignant love story that is written with absolute care and sensitivity for the era and subject. The character’s are realistic to the time, they have a heart-breaking tender and sweetness about them that will make you fall in love with them. This is an emotional book that will have you reaching for the tissues and fill your heart with love and joy for the festive season. I am in absolute love with this book, simply stunning! This was an ARC via the publisher in exchange for an honest review. The Daughters Christmas Wish is available from Amazon. This entry was posted in ARC, Choc Lit UK, Christmas, Historical Romance, Reviews, WW1 and tagged A daughters Christmas Wish, ARC, ChocLit, Christmas Romance, Cornish Tales, Historical Romance, Review, Victoria Cornwall, WW1 Romance. Set in the present day and during the horrifying years of the war, both woman discover deep down the strength and courage to carry on in even the most difficult of times. Through Alice’s words and her unfailing love for her sweetheart at the front, Gemma learns to truly live again.. I have read many stories set during the WW1 era but I think that this could be one of my favourites, it is simply stunning and one of those rare books that I did genuinely have a weep over. The last couple of pages will break even the most hardened of hearts. This is a powerful, emotional and incredibly poignant and romantic book that will leave the reader with a lump in their throats and feeling completely overawed by the unimaginable heart-break and loss and yet at the same time it is hugely satisfying. The Poppy Field is split between two era’s and follows two different but incredible woman who are both facing a tough and emotional time. Linked together through nursing, present day Gemma is a NHS trauma nurse, she is feeling the strain and is struggling by what she has experienced in her job. She needs to get away from everything she has seen and try to move on, so she agrees to help er father renovate an old farmhouse in Northern France. She only see’;s this as a break to basically clear her head, she doesn’t intend of staying in France. That is until two thing’s happen. One, she meets Tom, the supremely handsome contactor who has agreed to her her with the refurbishment; and two she finds an old box in the house that is full of letters from a woman called Alice who was a volunteer nurse during the great war. I think reading about and getting to know Alice through these old letters is so good for Gemma, she isn’t overly confident, she is definitely stuck in her shell and reading about what this amazing woman went through is a soothing balm for her. As Gemma and Tom get on with renovating the house, Tom is very smitten with shy Gemma, he sees something in her that she unfortunately doesn’t see herself; that she is a wonderful woman. As much as Gemma and Tom’s story is beautifully touching, I was particularly drawn to Alice. It was her story that found impacted on me, Alice left home and her fiancé to volunteer with the nursing corpse which just happened to be next door to the Somme so she saw some real horrors. The letters she had been writing were to two men, Peter and Ed, both we come to learn are such an integral part of her life. Through her own words we get a glimpse of her life, of her experiences and most importantly we get a real sense of the strong, patient, kind and utterly brilliant woman that she was. This book is incredible, it is a beautifully written, utterly mesmerising and beautiful story that captures the readers attention and takes them on a heart-wrenching journey through both of these amazing women’s lives. This is the first time I have read Deborah Carrs work and I can say for certain it will not be the last, her writing is gift we all need to receive. A captivating, poignant and beautiful book. This was a ARC copy via the publisher from Netgalley in exchange for an honest review. The Poppy Field is available now from Amazon and I say that you really must buy this one! This entry was posted in Harper Impulse, Historical Romance, Netgalley, Reviews, WW1 and tagged ARC, Deborah Carr, Harper Impulse, Historical Romance, Netgalley, Review, The Poppy Field, WW1 Fiction, WW1 Romance. Honoring those who have served their country in war, most focus on those who have fought on the battlefields. But one group’s heroics under fire have slipped through the pages of history, a group whose blood and sweat were left in operating rooms and hospital tents, a group whose heroism has seldom been measured. I knew when I came to read this book that it would be an emotional ride as I walked in the footsteps of such heroic and supremely inspiring women, but I was over-awed and whilst reading this book. I felt in so much awe of Gwen and her fellow nurses who did the most incredible job, these women were vital for the war effort. Jo-Ann Power has gone above and beyond with telling these extraordinary women’s stories, the depth of research is incredible at times it was like actually being standing right beside them. It painted an emotionally raw and brutally real picture of what these women went through. The story really follows one young nurse; Gwen – who is a hugely likeable character, a woman after my own heart she has spirit, determination, she has seen her fair share of troubles before she even goes into nursing, but those issues have made her the strong, reliable and passionate woman I found her to be. We first see her in nursing college where her and her close knit group of friends have fun between studies, once graduated they now face the real world. Unfortunately this world is now at war and Gwen soon finds herself facing all the horrors of the front, as she is sent to battled destroyed France. This is definitely the most heart breaking part of the book what Gwen and her friends face day in day out is harrowing. The picture of that dark and soul destroying place is vivid and real, Ms Power has done an absolutely incredible job at portraying the scene with the utmost realism and respect and this is where the authors research and brilliant writing comes in to it’s own, she captures your attention through out the book and I can guarantee that there is times you will get a lump in your throat ad tears in your eyes. Heroic Measures is an emotionally powerful read that will leave the reader in absolute stunned silence, it’s true, poignant and highlights an aspect of women’s history that I think a lot of us may have forgotten. Very highly recommended one of the best books I have read and one that everyone should read. This was a complimentary copy from the author in exchange for an honest review. Heroic Measures can be purchased at Amazon. This entry was posted in Complimentary copy, Historical Fiction, History, Reviews, WW1 and tagged Complimentary copy, Heroic Measures, Historical, Historical Fiction, Jo-Ann Powers, Review, Wild Rose Press, WW1. This is book one in the new ‘Captivating Captains’ series, and what an introduction! I think this is set to be a powerful and addictive series and a great addition to both Ms Curzon and Ms Hartstead’s catalogue, it is astoundingly touching and beautifully portrayed. There is heartache, tender romance and danger all wrapped up in brilliant story from an era that really doesn’t get show cased enough in Historical Romance – which I don’t know why, as it was such a intriguing era that had so much going on. On one summer day in 1917 a young trooper arrives at the Chateau de Desgravier, where a segment of the British Army is based. Trooper Jack Woodvine is a raw and inexperienced soldier having enlisted late due to a shoulder injury and so far, he’s seen very little in the war, but what he lacks in experience he makes up for in his skills with horses. He can calm and soothe the most stressed and temperamental animal and in doing so can also soothe the owners. As soon as he gets to the Chateau he soon finds out that this place could just be a dangerous as being at the front. Budding poet Jack has always thought there was something not quite ‘right’ about him, his desires don’t follow with what is expected, he has always hidden that side of himself and has never acted on his urges. Up until he had joined the army, he was always ashamed and embarrassed about his what he calls ‘unnatural desires’ and then he stepped into the Chateau de Desgravier and meets his commanding officer; the fierce, professional and charismatic Captain Thorne, who captures Jack’s attention and his imagination from the first moment he see’s him. But, surely such a fine figure of a man wouldn’t be interested in a lowly farmer’s son. Jack is a real cutie! He is just wanting to do his bit for his country, even though he had broken his shoulder – which would have meant that he would have been exempted – he still joined. Jack is such a cute lad, he is naive of the world around him I don’t think that he thoroughly realises what is in store for him and what he would be facing. Yet he yearns to take his place amongst all the others who have taken the King’s shilling, and I respect him for that. He isn’t made for war though, but he does feel very strongly about doing the right thing. I think in a way he wants to prove himself, he wants to show that he isn’t just a farmer’s son. Captain Thorne – Robert, is by far the most gruff and fiercest of all the officer’s, he is an experienced Captain and has seen way too much fighting. He is based at Chateau de Desgravier but he knows that it is only a matter of time before he and men at the Chateau will be deployed to the front, especially with the way the war is going and the amount of men that the army is losing on a daily basis. He really isn’t interested in anyone and finds that he isn’t in the right frame of mind to have his head turned by handsome young lad’s, that is until he meets his newest recruit. Jack sighed, a laugh in his throat. Jack is given the job as Robert’s groom, to care for his temperamental white horse; Apollo. Under Jack’s gentle and unwavering care of Apollo he starts to calm the tormented mind of the horse and in the process he and Robert begin to grow closer until they finally give into their mutual attraction for one and other. But, all does not go plain sailing for our couple, not only are they under constant threat from the war but there is danger’s lurking within the Chateau de Desgravier itself that Jack ad Robert have to overcome. Robert is a good man he wants to do the best for his boys, if he could he would send each and everyone of them home, so they can’t be hurt by the vicious fighting. He has seen what this brutal and violent war is doing to innocent young men and he has aged ten years since it started. He has been in the trenches and at the front and that has darkened him in ways that may never see light again, it has jaded him. Meeting Jack has really brought some fun and love back into his life and light back into his dark nearly dead eyes. And in return Robert is an attentive, caring and super sensual lover. They are such a cute couple and there are some really lovely and tender moments between them, I particulay like those quiet moments when they are just being themselves. There is a really lovely scene when they are having a quiet moment together where Jack is quietly writing a poem about Apollo while Robert is secretly drawing him. It’s so beautifully written and shows them for the tender and romantic men they are and gives them the moment of calmness before the storm as there are dangers on the horizon not just with the war but closer to home in the shape of their own comrades. Jack pressed his lips to Thornes neck. There are some real characters at the Chateau, from the manipulating and bullying Quin ‘Queenie’ to the cheeky and rakish, choir boy Bryn, the mix of different personalities gives the story a sense of real life. This is wonderful, a haunting tale of love found in the most unexpected and dangerous places between two characters, who are sensitive and courageous. Even though it is set right on the front with the war in the background, at a time where there was so much bloodshed and loss, the story is very much about Robert and Jack. It is very moving and beautifully written – not that I was surprised at that, as these two ladies are wonderful narrators. I do love The Captain and The Trooper, I will admit to being, a little biased as I already have a love for this era, but this really captures the imagination of that period but in a completely new and profound way. I am looking forward to reading more from The Captivating Captain’s, I think this series is going to be a wonderfully moving and addictive and I can’t wait to see where we go next. This was a ARC copy via the authors in exchange for an honest review. The Captain and the Cavalry Trooper is to be released on 3rd April and can be pre-ordered from Amazon. 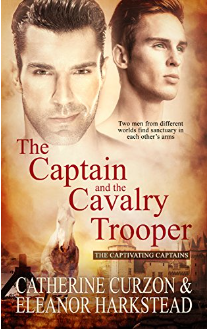 This entry was posted in ARC, Gay Romance, Historical Romance, Reviews, WW1 and tagged ARC, Captivating Captains, Catherine Curzon, Eleanor Harkstead, Gay Romance, Historical Romance, Pride Publishing, Review, The Captain and the Cavelry Trooper, WW1 Romance.